We would encourage anyone to come along, whether or not they keep a boat there, to find out more about the Staithe and to help contribute to the evening. The meeting will include presentations from the Norfolk Wildlife Trust, The Upper Thurne Working Party, The Environment Agency, Angling Groups and the Parish Council as well as an open discussion session where people can express their views and make suggestions. Light refreshments will be served at the close of the formal business of the evening. Broadsbeat officers are appealing for witness to come forward after more than nine crimes have been recorded at Hickling broad. The crimes happened overnight between Friday 9 September and Saturday 10 September 2016 where several boat houses have been broken into. Five Outboard Engines have been stolen from the site and damage has been caused when the suspects have entered the properties. Beat Manager for the Broads, PC Paul Bassham, said: “This is likely to have been a planned crime spree with Outboard Engines the intended target. We have started to see an increase in Marine related crime over the last month and would like to remind people to stay resilient. I would urge any members of the public who have information about this crime or witnessed any suspicious behaviour on the Broads to contact me. More information can be found on the Broadsbeat link via The Norfolk Constabulary website. Anyone who may have witnessed the crimes, has information or wishes to join our Boatshield email alert, should contact PC Paul Bassham from the Broadsbeat team on 101 or on Broadsbeat@norfolk.pnn.police.uk. Alternatively contact Crimestoppers anonymously on 0800 555111 or via their anonymous online form athttp://www.crimestoppers-uk.org/. If you have ever wanted to try windsurfing on Hickling Broad then this is your chance! Hickling Windsurfing Club are holding a Come and Try Day on the 22nd of May. For full details please click here. 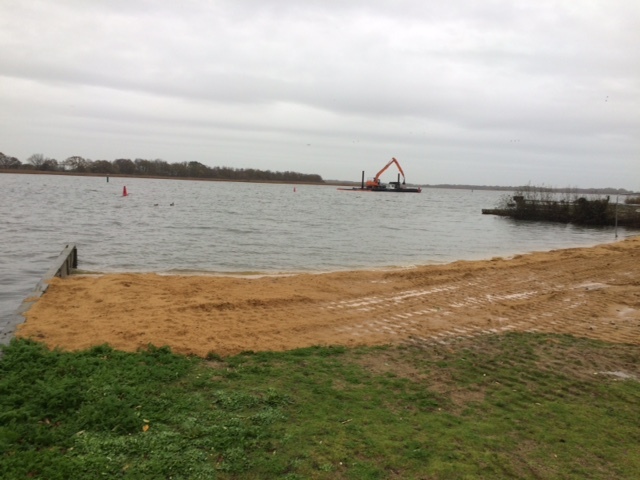 We are pleased to announce that 100 tons of sand has been placed at the beach. Part of the area has been cordoned off to allow time for the sand to settle. Please be aware that time will be required for all of the sand to settle. The cost of the sand and it’s placement has been paid for by the Mills Estate.